My AZ Lawyers is a Statewide Law Firm with offices in Phoenix, Mesa, Tucson, and Glendale, Scottsdale, and Avondale Arizona. Our bankruptcy lawyers and bankruptcy attorneys have assisted hundreds of people throughout Arizona. Our attorneys focus only on one practice area. What does this mean for you? This means that each of our lawyers are very proficient and experienced in their practice area. With the resources of our entire legal staff to represent you, you can feel confident all of your needs will be met. We will be with you every step of the way while you file for chapter 7 or chapter 13 bankruptcy protection. The general public has many misconceptions about declaring or filing bankruptcy. Be assured bankruptcy protection can be a very helpful tool for financial renewal. Call our Arizona bankruptcy law firm any time, at (480) 833-8000 or (520) 306-8729 to discuss your options with one of our experienced bankruptcy lawyers. Our bankruptcy attorneys will not speak to you in complicated legalese, instead they will explain in simple terms the options for relieving your financial situation, and the long term consequences of your decisions. Scheduling a free bankruptcy consultation with one of our trusted bankruptcy lawyers is your first step towards eliminating debt and getting a “Fresh Start”. Experienced and Professional Arizona Bankruptcy Lawyers. The bankruptcy attorneys at My AZ Lawyers provide personalized and compassionate bankruptcy planning and bankruptcy filing services to individuals, families, and businesses experiencing extreme financial difficulty. Our team of Arizona bankruptcy lawyers understand the sensitive nature of filing for bankruptcy and are committed to protecting your interests and maintaining the discretion you deserve. When dealing with bankruptcy issues, we know our clients are generally overwhelmed, stressed out, and concerned about the future of themselves and their family. You may be receiving harassing phone calls, legal notices, and threats of wage garnishments or lawsuits. We assure you that you can experience immediate relief from all creditor collection agencies. All future communications regarding your debt will be handled by your Arizona bankruptcy lawyer. Our legal team will keep you apprised of all that is happening with your case during the entire process. Many of our clients are simply individuals or families looking to get a fresh start or families trying to save the family home. Some of our other clients are business owners searching for bankruptcy attorneys sophisticated and experienced enough to handle more complex bankruptcy filings. Our bankruptcy lawyers offer chapter 13 bankruptcy filings and chapter 7 bankruptcy filings at a reasonable fee. Business clients include: retail stores, small businesses, service companies, and restaurants. When you need experienced legal representation from an affordable bankruptcy lawyer or attorney in Glendale, Phoenix, Mesa, Avondale, Scottsdale, and Tucson AZ, and in Maricopa and Pima County, Arizona, to best help resolve your legal issues, the My AZ Lawyers can help. Whether you need bankruptcy filing, Chapter 7 bankruptcy, Chapter 13 bankruptcy, wage garnishments, repossessions, estate planning attorney, debt settlement, wills, trusts, probate lawyer assistance, divorce, family law, contract review, contract drafting, or foreclosure law, the experienced bankruptcy attorneys at our Bankruptcy Arizona law office can assist any of these legal needs. Sign up for a free debt evaluation with one of our experienced, affordable bankruptcy lawyers in Glendale and Avondale, AZ. Our debt management specialists and bankruptcy attorneys in Glendale, Arizona can help. The My AZ Lawyers services all of Maricopa County and Arizona including the surrounding communities of: Anthem, AZ, Avondale AZ, Goodyear AZ, Prescott AZ, Peoria AZ, Scottsdale AZ, and Surprise AZ. 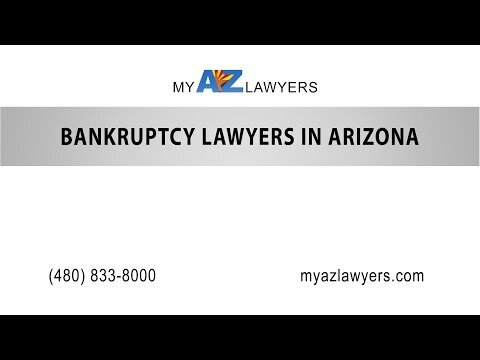 Bankruptcy lawyers at the My AZ Lawyers will help you with debt relief when student loans, mortgage payments, unexpected medical bills and credit card debt become too much. Our Arizona bankruptcy attorneys understand the challenges and difficulties that accompany overwhelming debt. We want you to know that in many cases, bankruptcy may be your best option. Our experienced bankruptcy attorneys offer the personal help you need to protect your assets, stop creditors from harassing you, and make a fresh start. First step to taking control over your debt: call My AZ Lawyers Bankruptcy Law Firm. When phone calls from creditors won’t quit, when your family life, professional life, and personal life is affected by debt, it is time to consult an expert in Arizona Debt Relief. Our Arizona Bankruptcy Law Firm offers a FREE CONSULTATION. Get information, answers, advice, and options that will help you make good decisions for your financial future. Bankruptcy is only one option for debt relief, and the team at My AZ Lawyers will give you an honest evaluation of your case, and work to provide you with the best possible outcome for your situation. Is overwhelming debt affecting your life with family and friends? Do you wish that you could change your financial situation so that you could enjoy vacations and free time? Are unexpected circumstances in your life influencing your future plans? Are your finances controlling the life of you and your family? There is no need to let your debt control your life. The bankruptcy lawyers at the My AZ Lawyers are here to assist you. Our experienced team of professionals is ready to help you get a fresh financial start. Call us today at (623) 640-4945 so our Arizona bankruptcy attorneys can begin putting our debt relief strategies to work for you. Our firm offers flexible scheduling, several Arizona office locations, and payment plans / financing options to make your debt relief affordable and convenient.